Despite their decision to disband following Messiah Complex, the X-Men have remained pretty active. And, although there are former members scattered to every corner of the globe, a few clusters of Xavier’s former students have hung together. Cyclops and Emma Frost have gone to San Francisco in search of Angel, while Wolverine, Colossus and Nightcrawler have journeyed to Europe, and neither group’s travels have been uneventful. In Scott and Emma’s case, the landscape looks an awful lot like it did forty years ago, thanks to the Mastermind and her powers of illusion. Logan, Piotr and Kurt, on the other hand, have been taken prisoner and subsequently barreled chest first into an angry Omega Red. Ed Brubaker’s swan song with Uncanny X-Men, (Matt Fraction debuts in issue #500) is sadly not his finest hour. The writer never really clicked with the mutants like he did with Daredevil or Captain America, and his final chapter with the team is just further evidence of that. This month’s dueling teams of X-Men aren’t very compelling; Scott and Emma explore the offbeat and bizarre while the other three sail thoughtlessly into a cover-to-cover brawl with Wolverine’s old nemesis. There’s no individuality here - outside of their powers, each of these characters are interchangeable with the others. They fire off bad one-liners faster than they do optic blasts, and there’s always, always a reason to leap into action right around that next corner. 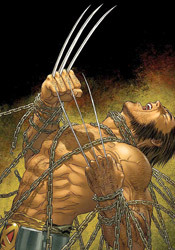 Each assigned to their own group of splintered X-Men, Mike Choi (Emma and Scott) and Ben Oliver (Wolverine, Colossus and Nightcrawler) bring vastly different artistic styles to the book. Choi’s artwork is more concerned with expression and simplicity, while Oliver’s contributions are darker, more reliant on excessive coloring, and overflowing with details. If you remember the old “Marvel Masterpieces” line of trading cards that were all the rage in the early ‘90s, I get exactly the same impression from Oliver’s work as I did from that series. It frequently goes way, way over the top to the point that the page is awash in so much visually that I had trouble following the action and understanding what was going on. Mike Choi’s artwork doesn’t suffer from that problem, but because it’s so much simpler and cleaner, the seams in his style are much more pronounced. Something about his White Queen doesn’t feel right, and he often leaves out too many details in his quest to rid the page of inessential linework. I really don’t think the two could be much more of an opposite to one another, and although my preference is for Choi’s take, neither artist seems like they’re ready for this kind of a high profile book. There’s not very much worth thinking about here. Ed Brubaker’s story is skin and bones, simple housekeeping before he departs the series for good, and lacks every bit of the intelligence he brings to his other big Marvel stories. His tandem of accompanying artists deliver work with a similar ethic – they’re just here to kill some time before Greg Land and Terry Dodson step in next month. This issue is in a holding pattern, here to fill in a gap before the next regime sweeps in. Skip it, even if you’re a big fan of the X-Men.